North Korea has shifted a missile with “considerable range” to its east coast, South Korea’s Foreign Minister Kim Kwan-jin has announced. Kim Kwan-jin played down concerns that the missile could target the US mainland, and said North Korea’s intentions were not yet clear. Pyongyang earlier renewed threats of a nuclear strike against the US, though its missiles are not believed to be capable of carrying nuclear warheads. The US is responding to North Korea by moving missile defense shields to Guam. Meanwhile, Russia said Pyongyang’s attempts to “violate decisions of the UN Security Council are categorically unacceptable”. “This radically complicates, if it doesn’t in practice shut off, the prospects for resuming six-party talks,” foreign ministry spokesman Alexander Lukashevich said in a statement on Thursday. The talks involving North and South Korea, the US, Russia, China and Japan were last held in late 2008. Japan said it was co-operating closely with the US and South Korea to monitor North Korea’s next move. Japan’s PM Shinzo Abe said that although the rhetoric was “increasingly provocative”, Tokyo would “calmly” watch the situation. Government spokesman Yoshihide Suga earlier told reporters that Japan was braced for a “worst-case scenario”. The Pentagon said the shield on its Pacific island territory would be ready within weeks, adding to warships already sent to the area. North Korea has previously named Guam among a list of possible targets for attack that included Hawaii and the US mainland. Japanese and South Korean reports had suggested the missile being moved by North Korea was a long-range one with a capability of hitting the US west coast. However, experts believe North Korea’s most powerful rocket, which it test-fired last December, has a range of 3,700 miles (6,000 km) and can reach no further than Alaska. Kim Kwan-jin told MPs in a parliamentary defense committee meeting that the missile had “considerable range”. “The missile does not seem to be aimed at the US mainland. It could be aimed at test firing or military drills,” he said. 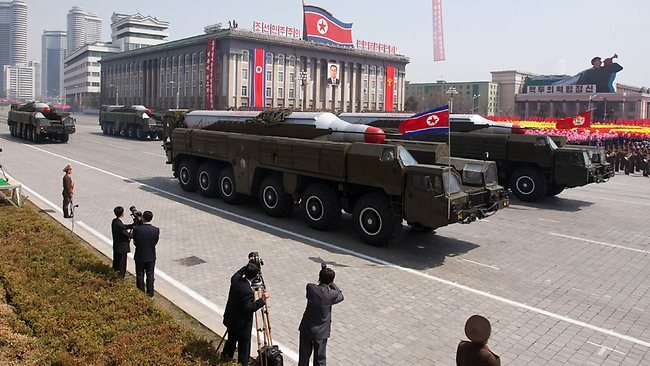 Analysts have interpreted Kim Kwan-jin’s description as referring to the Musudan missile, estimated to have a range up to 2,500 miles (4,000 km). Guam would be within that range. North Korea is believed to have its main military research centres in the east. It has test-fired missiles from there before, and its three nuclear weapons tests were carried out in the east. Despite its belligerent rhetoric, North Korea has not taken direct military action since 2010, when it shelled a South Korean island and killed four people. In recent weeks North Korea has threatened nuclear strikes and attacks on specific targets in the US and South Korea. The communist country has announced a formal declaration of war on the South, and pledged to reopen a mothballed nuclear reactor in defiance of UN Security Council resolutions. In its latest statement, attributed to a military spokesman, North Korea appeared to refer to continuing military exercises between the US and South Korea in which the US has flown nuclear-capable bombers over the South. The statement said the “ever-escalating US hostile policy towards the DPRK [North Korea] and its reckless nuclear threat will be smashed”. North Korea promised to use “cutting-edge smaller, lighter and diversified nuclear strike means of the DPRK” and said the “merciless operation of its revolutionary armed forces in this regard has been finally examined and ratified”. The US Department of Defense said on Wednesday it would deploy the ballistic Terminal High Altitude Area Defense System (THAAD) to Guam in the coming weeks. The THAAD system includes a truck-mounted launcher and interceptor missiles. US officials recently also announced that the USS John McCain, a destroyer capable of intercepting missiles, had been positioned off the Korean peninsula. Some analysts say Pyongyang’s angry statements are of more concern than usual because it is unclear exactly what North Korea hopes to achieve. As well as the angry statements, North Korea has also shut down an emergency telephone line between Seoul and Pyongyang and stopped South Koreans from working at Kaesong Industrial Complex in the North. Kaesong industrial park, one of the last remaining symbols of co-operation between the neighbors, is staffed mainly by North Koreans but funded and managed by South Korean firms.